Getting your contract secured before the first snowfall of the year can help guarantee accurate measurements. This allows a physical site visit and in-the-field-measuring on any areas that are unclear via satellite imagery. If the property is covered with snow, it cannot be measured properly until the following spring. Some contractors limit the amount of new snow removal work they accept each season. You might compromise service if you wait until the last minute to solicit bids. There will always be someone to service your commercial or industrial property, but it limits your options on choosing the best contractor for your customized requirements. By planning and securing a snow contract early, it allows your snow contractor to allocate the appropriate equipment necessary to service your property i.e. skid, loader with pusher box, 550 with a plow, epoke for salting, etc. Not having a snow contractor in place well before the first snowfall of the season can be detrimental to the safety and convenience of your employees and visitors. 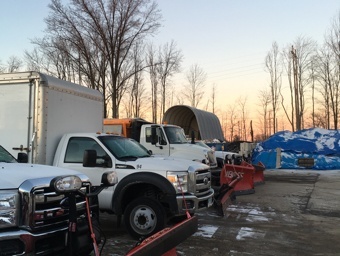 Contact a reputable commercial snow removal company today…it’s never too early.